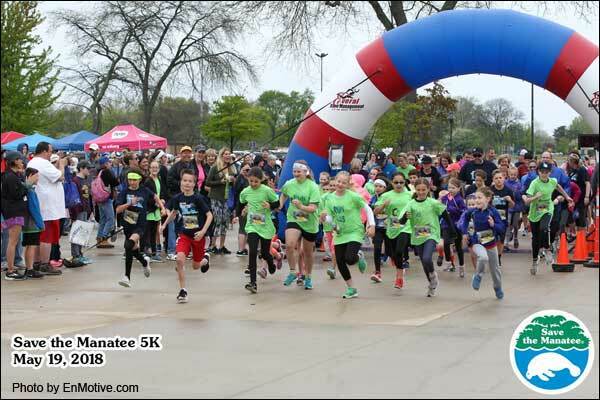 Over 800 runners participated in the 15th Annual Save the Manatee 5K Run, 2 Mile Walk and Mini-Manatee-Mile on May 19th at Lake St. Clair Metropark in Harrison Township, Michigan. It was a gray and slightly rainy morning in Michigan in mid-May, but that didn’t deter the 862 runners from showing up for the 15th Annual Save the Manatee 5K Run, 2 Mile Walk and Mini-Manatee-Mile at Lake St. Clair Metropark in Harrison Township, Michigan. The popular race, hosted each year by L’Anse Creuse High School biology teacher Lesley Argiri and her husband Brian McDonald, helps raise funds for Save the Manatee Club’s numerous conservation efforts. The race has raised $206,000 since its take-off in 2003. All participants received a unique race t-shirt and beautiful finisher medal. As in past years, Save the Manatee Club had an Adopt-a-Manatee table at the race and signed up an incredible 81 members — a new all time record! Each person who adopted a manatee at the $35 level automatically received a free race registration for next year’s race. Richard Odendahl crosses the finishing line of the Save the Manatee 5K holding up “Manny,” his stuffed manatee. Cora Berchem, SMC’s Manatee Research & Multimedia Specialist, represented the Club at the race once again. “With 19 other events going on in the same area that day, I was a bit worried not as many people would show up for the race and adopt a manatee, but I was wrong,” said Cora. “Lesley dedicated this year’s race to manatee Snooty, and it is just heartwarming to see how many people support manatees and make his legacy live on.” Leonard Constantine, who has attended the race for several years, adopted a manatee for the third year in a row. “I opened the adoption book to see which manatee I would pick, and it opened on the page for adoptee Lenny,” Constantine said. “A manatee that shares my name seemed like the perfect choice. I have re-adopted Lenny every year since”. Once again, Joel Darling and his wife Jennifer from the Darling Cetacean Society partnered with Save the Manatee Club on a manatee game where players match manatees based on their scar patterns. Save the Manatee Club presented Lesley Argiri with a book chronicling the past 15 years of the race. “I can’t believe this race has been going on for 15 years now, and it just keeps growing,” Argiri said. 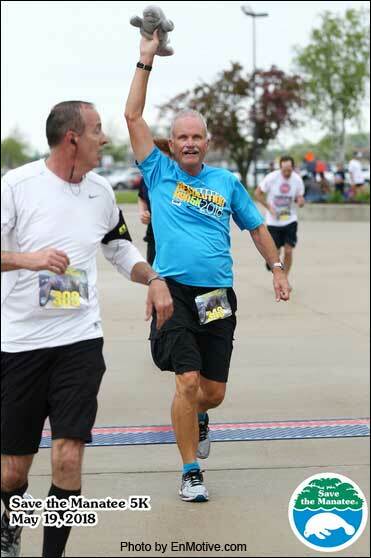 Race participant Dave Cottrell posted on Facebook, “My first time participating in this race and it was well staffed, organized, and an all around a fun race! I have the date saved and we’ll see you next year!” Richard Odendahl from Harrison Township, MI, who spends the winters in Florida with his wife, loves manatees and was spotted crossing the finishing line holding up “Manny,” his little stuffed manatee. For the 4th year in a row, Lesley and Brian also offered the “virtual option” again, allowing people from around the world to run, walk, swim, bike, hike, or kayak the race on their own time. This year, there were 1,148 virtual participants representing all 50 U.S. states and 15 foreign countries. Virtual Race participant Tuulia Humalamäki and her friend Elli in Finland.